Celiac disease affects an estimated 2 million Americans and makes them unable to tolerate the protein gluten, which is found in wheat, rye and barley. But, as The Early Show medical contributor Dr. Emily Senay said, celiac disease can be very hard to diagnose because symptoms vary. Digestive tract symptoms include abdominal bloating and pain, gas and diarrhea. Some people suffer no digestive distress and their symptoms may include fatigue, anemia, behavioral changes, bone or joint pain, or seizures. Dr. Senay said some women may miss their periods and if the body isn't absorbing all the nutrients, a person may suffer malnutrition. "When a person with the disease eats gluten, the body's immune system attacks the small intestine as if the intestinal wall were a foreign object," Dr. Senay told The Early Show co-anchor Julie Chen. "As a result, small protrusions from that wall called villi are broken down. Since villi are essential to getting nutrients into the bloodstream, destruction of those villi can eventually cause malnutrition." If people avoid eating gluten, they should be able to heal within six months to two years, Dr. Senay said. Because of the plethora of symptoms, Dr. Senay said a blood test is the best way to detect celiac disease. The test identifies the antibodies related to the disease. People who routinely experience these symptoms or people with relatives with the disease should get screened, she said. 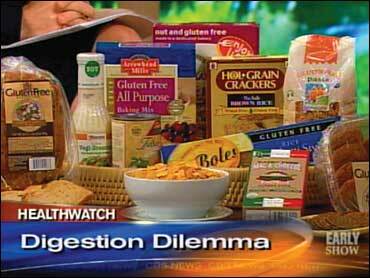 Unfortunately, Dr. Senay said there is only one treatment: stop eating foods that contain gluten. That includes most grain-based foods such as pastas and cereals. Some processed food might be dangerous as well. Dr. Senay said people with celiac disease can build the foundation of their diet on fresh fruits, vegetables and meat, poultry and fish that are prepared plain. "And there are now gluten-free substitutes for a number of popular foods," Dr. Senay said. "There's gluten-free bread and cereal and soup and salad dressing and even cookies. You may need to hunt for them at a health food store, or on line. And some of them are pricey, but they're available. Whatever packaged food you buy, be sure the label says 'gluten free.' Otherwise, ingredients involved in the processing may contain gluten, even if wheat, barley and rye are not components of the food you intend to eat." Editor's note: In an earlier version of this report, the photo caption incorrectly identified the products shown as foods that contain gluten. The error has been corrected.